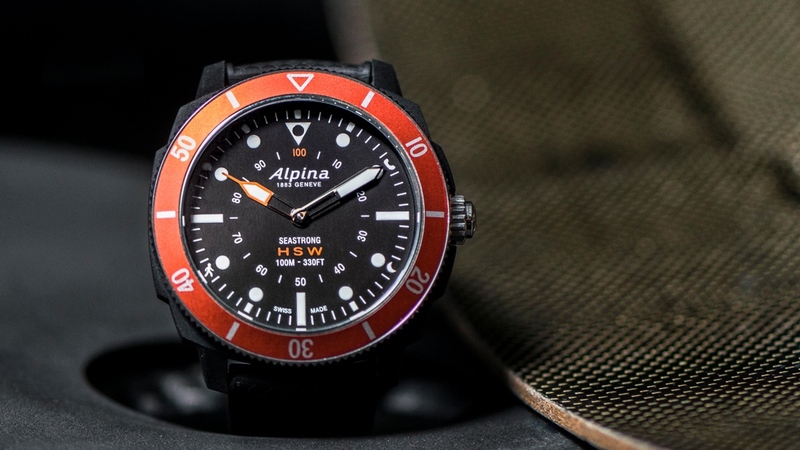 Continuing its standing within the hybrid smartwatch scene, Alpina has announced the Seastrong Horological, a new diving smart analogue watch for 2017. The Swiss watchmaker has released sports variants for both women and men over the past two years, with the new Seastrong design again featuring a connected module created in collaboration with the MMT (Manufacture Modules Technologies) collective. This allows you to pair your iOS or Android device through the MMT-365 app to receive calls and notifications, with the hybrid watch also able to track your activity and monitor sleeping patterns. And if you happen to spend too much time sitting at the desk, Get-Active Alerts will prompt you to move about. As was the case with Alpina's previous smartwatch entries, you can also receive health tips through Dynamic Coaching, a feature based on your activity and sleep goals. What's under the hood of the smartwatch hasn't varied significantly from its siblings, but design is always the bigger factor to consider when discussing high-end hybrids. The Seastrong collection is made up of four models, with each giving you a different bezel colour to choose from — black, green, orange and navy blue. And divers will be happy to know that the 44mm fibreglass case features a 60-minute uni-directional bezel, acting as a fail-safe option to prevent the number of elapsed minutes from accidentally decreasing. As far as water resistance goes, the Seastrong lives up to its name by allowing you to plummet 100m/330ft and still view the luminous hands, indexes and markers displayed. So if you're looking to smarten up your wrist on both a figurative and literal front, you can pick up one of the new models for 595CHF - which is around $600. We catch up with Alpina at Baselworld in March so stay tuned for more pics and impressions.